Out for an early evening drive, my wife and I came upon this Old Order Mennonite buggy near the summit of Mole Hill Rd., west of Harrisonburg, Virginia. 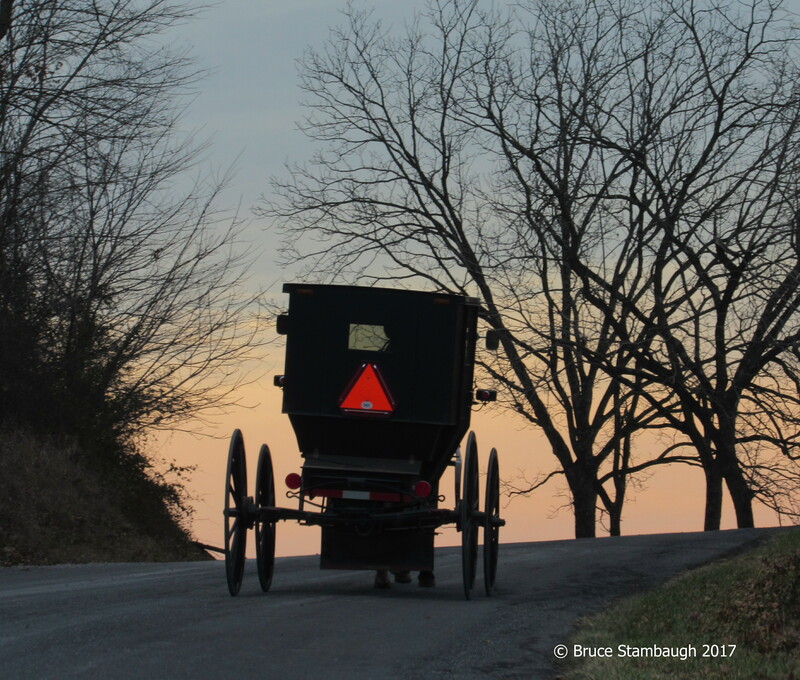 Having lived in Holmes County, the heart of Ohio’s Amish country, for most of our adult lives, we were used to following buggies up and down the rolling hills and winding roads. Now that we live in Virginia’s Shenandoah Valley, we occasionally have the same experience since we live near Dayton, the center of life for the thriving Old Order Mennonite community. Like the Amish, they, too, stay rooted to the land by using the horse and buggy as their chief means of local transportation and by their rural, agrarian lifestyles. Also, like the Amish, they hire drivers to take them on longer trips. Shortly after I snapped this photo, the buggy turned left, hurried up a long lane to home. The short scene was a happy reminder of the life we lived in Holmes Co., Ohio, and an affirmation of the new life we have begun in the Commonwealth of Virginia. “Almost Home” is my Photo of the Week. What a great picture. Did you take it through the windshield of your car, if I may ask? I also love your title for it. Thanks, Melodie. Yes, indeed, I did shoot it quickly through the windshield. I like to be as discreet and respectful of their beliefs as I can be. I also appreciate your insight on the title. I want the photo and title to share the same story. As always, thanks for the link, Kevin. Been on that road many times, gorgeous spot! Glad you are getting to explore the Dayton OOM community! Have you stopped by Everett Burkholder’s buggy shop yet? No, I haven’t, Kevin. That’s on my to-do list.